Installing HD cabin displays alone isn’t enough to get HD video in the cabin. Why? 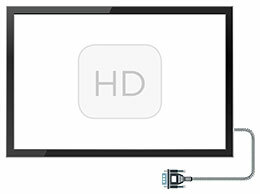 HD won’t work with legacy Cabin Management Systems (CMSs) because they use an old technology platform that isn’t compatible with HD signals. This has come as a surprise to more than one operator that I’ve talked to. For a long time, core aircraft systems didn’t need modification to modernize the cabin because the technology never changed. Manufacturers just made better equipment using the same technology. A lot of airplanes migrated to better equipment to keep the cabin up-to-date, but they never migrated away from the old technology. It still used the same signal. The first thing people expect from an HD upgrade is a new monitor. What they don’t understand is that the monitor alone won’t give them HD video. Somewhere between the monitor and the Blu-ray player is an impressive amount of wiring and the aircraft’s CMS. Both directly affect the quality of the video that appears on the cabin monitor, and the ability to add on new equipment in the immediate future. HD is a new technology, a new signal, and we can’t integrate it correctly until we upgrade the entire platform that connects the majority of systems in the cabin. It all comes back to the fact that the old technology can’t support the new signal. For cabin monitors to reach their maximum potential, the wiring installed in the cabin must be able to support the HD signals sent by the CMS. The analog wiring interface may need to be (or should be) replaced with a digital wiring interface. Ideally the CMS, monitors and wiring should all support the same video signals. This reduces transmission delays and switching issues, which are common problems for legacy systems. Duncan Aviation has a chart of video resolutions supported by different cable types available in a field guide to HD cabin entertainment upgrades. There are HD upgrade alternatives, like creating one-off, workaround solutions for each new component, such as a Blu-ray player. Additional units can be bolted on to translate between the old and new technology, but it tends to create more problems than it solves, like switching and latency issues. In the long term, the amount of downtime, troubleshooting and repair costs can easily become more expensive than the initial cost to upgrade the CMS. If passengers want HD, and they want it to last, they need to be prepared to pay significantly more than what their home entertainment system cost. The reason is upgrading to HD involves much more than just upgrading to HD monitors. For more information about cabin HD upgrades, read “HD Cabin Entertainment Upgrades: Requirements, Upgrade Paths and Alternatives” at www.DuncanAviation.aero/fieldguides. Duncan Aviation designs and installs complete HD upgrade solutions for a variety of business aircraft, and we offer a three-year warranty on labor and workmanship. We are among the most innovative and experienced with avionics systems modification and installation in our industry, which results in fewer squawks and more on-time and under budget deliveries. Contact an Avionics Installations Sales Rep. for more information. Chris Christianson serves as an Avionics Tech Rep at Duncan Aviation’s Lincoln, Neb. (LNK) full-service facility, specializing in Astra, Challenger, Citation, Embraer, Falcon, Gulfstream, Hawker, Learjet, Global and Westwind aircraft. His aviation career began in 1997.